He thanked all the media for their messages of support and sympathy in the wake of Ivan's death. He also reiterated the messages of his Birmingham speech from last Friday. Mr Cameron's only new announcement was that as of now the Conservatives supported freezing the BBC licence fee for a year, and that the party would continue to look at it "on a year by year basis". He said that it was important to recognise that everyone has to live within their means at the moment and that an organisation such as the BBC should have to do so too. However, he declared: "I am a supporter of the BBC, I am a supporter of the licence fee" and that it could "go on as the principal way of funding the BBC for some time". See Jeremy Hunt's post on CentreRight for more details. He said he disagreed with Liam Donaldson's proposal on alcohol duty, and re-iterated previous Tory proposals to put up duty on high strength beer, lager and alcopops. He said that he didn't think Liam Donaldson's proposal was "a very fair way to proceed" and that action needed to be targeted at problem drinkers - and the kind of drinks they buy, such as high strength cider which has "never seen an apple". Asked by George Pascoe-Watson of The Sun why he was making such an issue of the Binyam Mohamed torture allegations, he said that torture was "immoral" and that it was important to get to the bottom of whether Mohamed was tortured and whether Britain was complicit in it. However, Mr Cameron added that he does not necessarily put "faith or credence" in all his words, saying that he did have questions to answer himself, adding: "Do I think he's an upstanding citizen? Almost certainly not." Fraser Nelson of The Spectator asked whether he could name five reasons to vote Conservative. 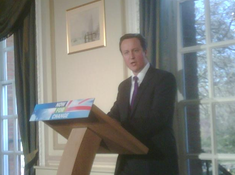 Mr Cameron said the Government was tired and exhausted and had run out of ideas; the Conservatives would give people more power and control over their lives; they would drive power to local government and people; they'd move away from an economy built upon debt to an economy built on saving; he highlighted the Conservative "menu" of mending the broken society, including radical school reform, pro-family policy in the benefits and tax system, encouraging couples to stay together; and the plans for radical welfare reform. On the EPP, he said that he had actually had a good meeting with European Commission President Barroso this morning and that it was right to leave the EPP so that what the party says in Brussels and Strasbourg is the same as what it says in Westminster. "I don't want to see further transfer of powers [to the EU]. The process of integration has gone too far already." He added that a new centre-Right grouping would still be able to work with the EPP when there were issues on which they agreed - but that the Conservative Party wanted to be a "friendly and happy neighbour, not reluctant and unhappy tenants". A journalist from the Newcastle Journal tried to extract an apology for the Conservative Government's actions in the North East during the miners' strike. Mr Cameron said that he was "a great believer in apologising for my own mistakes" but that he didn't believe in apologising for things which happened twenty or 100 years ago. He said he didn't expect to be meeting President Obama when he is in London for the G20 next month. "I'm not trying to muscle in on the G20. It isn't normally possible to have those sorts of meetings... I haven't requested one and don't expect one to take place". He did, however, say that it was his role "call the Government to account" over decisions made at the summit. Finally, I suggested that with Lord Mandelson refusing to debate Ken Clarke on television, that it was time to change the Standing Orders of the House of Commons to allow Lord Mandelson to answer questions at the Despatch Box in the Commons and be held to account for his department's actions in the elected chamber. Mr Cameron said that it was "an intriguing idea" and that since Ken Clarke had chaired the party's constitutional task force, perhaps it was something he could examine. Shame about his support of the licence fee. A regressive tax if ever there were one, to support a fundamentally anti conservative organisation. "go on as the principle way of funding the BBC for some time". Every Conservative government has kept the licence fee since it was brought in. Freezing it is the most any can expect for now - there needs to be a proper review only after Cameron is in power. The license fee shouldn't be frozen it should be slashed to £50. Never mind that some poor 70-year old in a council flat has to fork out 130-odd quid, wossie's got to have his 16 million you know. There are many other obscene BBC salaries too. (Lineker, Chiles, Logan...need I go on?). Surely Dave knows this. The meejah are obsessed with the taxes on alcohol and Cameron talks about the BBC. Haven't either of them noticed that the Bank of England has warned this morning of a total failure of bank bail-outs and warns of "Tensions in the financial system are approaching the fever pitch they reached before the collapse of Lehman Brothers last October"
Why can't the Party commit itself to selling off the BBC? We might then get less institutional left wing bias in its successor and better quality tv than the repeats and reality tv garbage that we get now? Plus it means a tax rebate for every licence payer in the country. I'd vote for it. I notice although supporting the BBC licence fee in principle Cameron has committed himself to reviewing it on an annual basis. Re the BBC. In my opinion what is needed is an inquiry into whether their coverage is as balanced as it should be. Looks like the BBC have already got their revenge. They have quoted Cameron as saying on Europe: "I profoundly believe that we should be in the European Union but we want to see a further transfer of power from Westminster to Brussels" (missing out the word "don't"). Why can't the Party commit itself to selling off the BBC? We might then get less institutional left wing bias in its successor and better quality tv than the repeats and reality tv garbage that we get now? That's assuming the BBC didn't successfully sabotage Cameron's election campaign. If it knew it was going to be privatised it wouldn't have anything to lose by doing so, would it? At least give the BBC a reason to believe being even partly neutral might be in its best interests! What support can the be for 'ever closer union' if the process has already 'gone too far'. I look forward to this being expanded upon. Freeze it for one year insist on change, and see if the corporation will play ball? Insist on greater balance and less lopsided twist spin from their lefty leaders. A few heads might have to go. We could do with a patriotic splurge and the build up to the London Games might make a good cover for gear shift changes. The BBC is essential but it has to represent Britain and so it must be subject to political control. It must represent the crown. We may even have to consider how we undo the damage done by 24hour television. As it no longer starts of ends the BBC must be made to find time in its schedule to play the national anthem. We should have at least this dignity returned to our royal people. It galls me no end that Labour has spoiled my Britain, but I do expect her to rise up from this mess, reinvented and more able to offer prosperity to its people. Slash the fee (£50 per year is ample) and cast tham adrift on the sea of competition to earn further funding. They can then recruit and produce on an equal footing with private services. They keep saying that they pay huge salaries to attract the right people, now's their chance. The amount of money available to the BBC's customers (the captured audience) is dwindling fast, David, in his ivory tower, is drawing his handsome salary and topping up with allowances and other perks and that artificial world shields him from the realities facing us mere mortals. Everyone should shoulder a portion of the pain of the financial fiasco in which we find ourselves. Cameron and the BBC should not be excused. A freeze for one year in the licence fee would save people three pounds. This is just another example of how little Cameron really as to say about helping the country and people beat the recession. No policies. No idea!!! Patrick Harris is right - cut the BBC licence fee. Most retailers are slashing prices - so should the Beeb. He could certainly make a statement about the 'digit switchover surcharge'. It is £6 and included in the licence fee. Ofcom (supposedly the publics champion) has suggested that once the switchover is complete the BBC could keep the charge for other purposes! This is the nasty woolly socialist thinking of "where can get more tax? Great now what shall we do with it?" Spending must lead - define the essential spending then use tax to raise the money to cover for it. Anything that is optional should be left to people to organise themselves - it is their choice - right down to if people want bottled water they can supply it themselves. Millions of pounds are spent making tap water pure enough for drinking, to then make the public pay again for bottled water is an insult. And better pay local bods to wash up jugs, then pay some multi national to treat, bottle, pack, distribute and dispose. Jonathan, Your suggestion that Lord Mandelson could be held to account in the House of Commons is a very interesting one indeed! Perhaps it should go along with Convention now apparently falling into disuse that ministers who fail should resign?